Put down the strudel — this is the fibre-filled, on-the-go breakfast you’ve been waiting for. 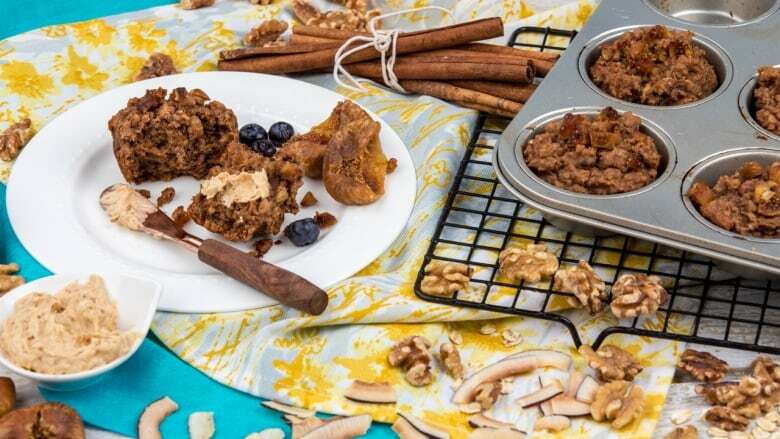 These muffins are chock-full of fibre thanks to figs, chia and ripe banana. A guilt-free breakfast, they’re perfect for those mornings on the go — and they're great for keeping you regular. This recipe from holistic nutritionist Peggy Kotsopoulos uses a chia mixture as an egg substitute, and gluten free oats and brown rice flour to make it a vegan gluten-free option. Plus, they’re also low in sugar and high in heart healthy fats — so they’re basically everything you could want for breakfast all packed into a muffin. For fig paste, rehydrate dried figs in a bowl of warm water for about one our until they are plump and tender (Or to speed things up, bring water to a boil in a saucepan then reduce to low heat. Add the figs and simmer for about 15 minutes.) Once rehydrated, add to food processor and blend until smooth. You will need ½ cup for the recipe. Next, place ground chia in a small bowl. Add warm water and mix with a fork. Set aside for a few minutes until it forms a gel. Now mash your ripe banana in a large bowl and add coconut oil, almond butter, vanilla, almond milk, maple syrup, chia seed mixture and 1/2 cup fig paste, whisk until combined. Sift in brown rice flour, baking powder, baking soda, salt and cinnamon and fold until well combined. Fold in rolled oats, chopped walnuts and chopped dried figs until well incorporated. Grease a 12 count muffin tin with coconut oil and drop in batter evenly across all 12. Bake at 350F (175C) for 25 to 30 minutes or until toothpick comes out clean, enjoy!